What a month September was for us! Cutting a very long story short, the handover of the building was delayed and we took practical completion on Friday 30 September, with the doors opening for the first sessions by 9am on Monday 3 October (Week 2). Huge thanks to everyone involved in the project - it was such a fantastic team effort and special shout-outs must go firstly to our in-house Learning Spaces and AV team who built and installed the equipment in the learning spaces, and to our Facilities Manager John Maddison who is in the building most days making sure things are working as they should. 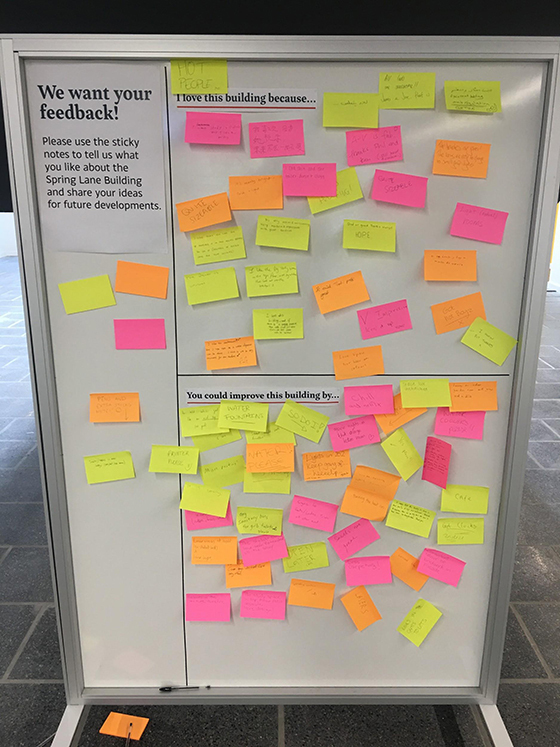 We still have lots to finish off (defects/snags) but the learning spaces themselves are receiving some fantastic feedback on twitter, email and on the feedback board we have in the Atrium. We’re going through all of these and will take the feedback to the Learning Spaces Working Group, so we can look at how we can address items. More ‘You said, we did’ to come! 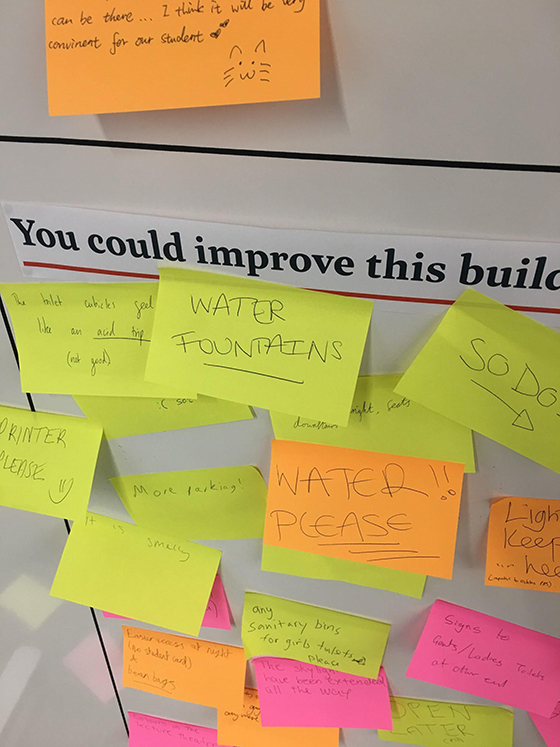 For example, the water fountains are being installed very soon, the vending machines are almost operational and we have a Multi-Functional Device (MFD) going on the top floor of the building for printing, photocopying and scanning. One of my personal favourites for the building: our first video wall on campus! You will see some great content coming this way in the future. 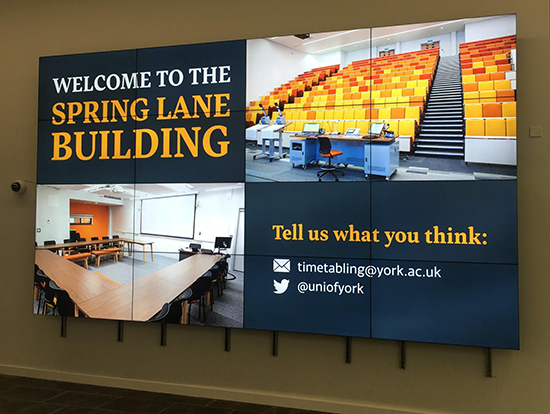 We’re also busy installing other digital display screens around the building to show ‘what’s happening’ right now along with other messaging to keep staff and students in the loop. Make sure you pop in and have a look around if you get the chance, and we’d love to hear from you. Please let us know what you like and what you think could be improved! I think you've done a super job on the building. 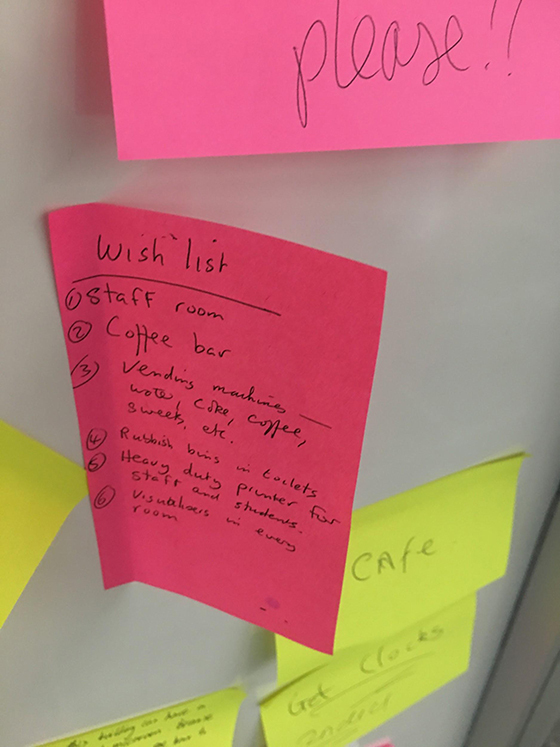 I left the barely legible note that says the benches are great and that the rooms are easy to switch into small group work. Since then, I've seen the rooms at the top, that look very interesting. I've given a lecture now in the big theatre, and that's super; the AV set-up there works really intuitively. If I ask nicely, can I use the video wall to play Skyrim one evening? 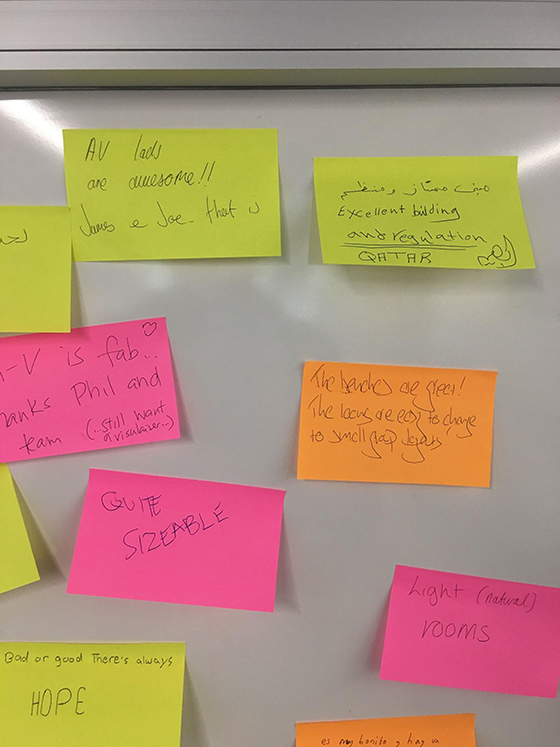 Thank you for your feedback - really appreciated and good to hear you are enjoying using the spaces and the new style of learning spaces furniture. The AV controls have been updated and glad to hear it works intuitively. Whilst we hadn't envisaged the video wall for gaming, in the interests of testing out the screen's functionality we may invite you to be a guinea pig for us. Please do drop a line to the room bookings team. The layout and infrastructure are great! I am curious about study-spaces though: minus the top-floor open spaces: can one simply use empty-rooms to study in when they are not booked? Is there an option for empty rooms to be displayed on the screen-wall in the entrance? You are very welcome to use any empty room - which the viewing panels in to the room may help identify. We have rotating digital signage in the building to identify which rooms are currently free (and they can then be reserved for you via the Room Bookings team). Our Digital colleagues are overhauling the 'view room bookings' signage pages to make them much more helpful and work on the new video wall. Watch out in the coming weeks!